There is going to be a Digimon Adventure escape room called "Digimon Adventure- A Written Challenge from the Dark Masters: The Trapped House... Pinochimon!" Escape rooms are roughly what they sound like, you go thru a series of rooms (generally with friends) trying to solve puzzles to 'escape' them. The key art for the event features new artwork of Taichi, Agumon, and Pinochimon from Adventure. Update- We have the plot/setup for the escape room. Thanks to garm for the translation. Faced with the Dark Masters' great, overwhelming power, the children find themselves at wit's end, and eventually end up in a house in a forest while searching for a safe place to rest. However, they had fallen right into Pinochimon's trap, and got locked up in the house. Will the Chosen Children be able to escape safely? Watch this mission story unfold as you solve the mysteries within this specialized room. Save the Chosen Children with your quick-wittedness! The official Digimon Twitter has also noted this is the first event for the Digimon Adventure 20th Anniversary. 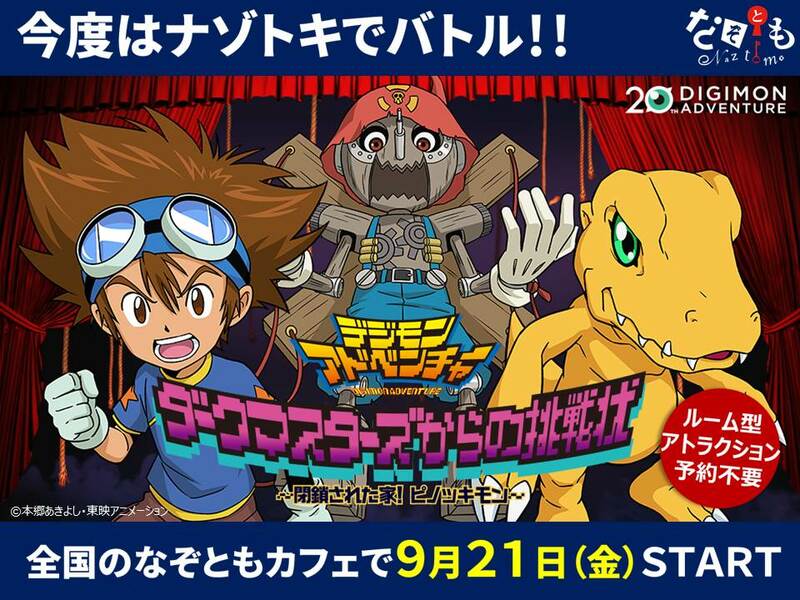 Nazotano will be holding the Digimon escape room at all of their Nazo Cafe locations beginning September 21st. I always wonder if these are fun or just frustrating; not that I don't love my friends, but I also don't see us surviving an escape room. Would totally try this though. It was only once, but did do one with a group. Solving things together and contributing your own logic to a puzzle solution (which I had zero of) is a real good feeling. The one we did do had an extra incentive to finish before the timer in that we'd all be jump scared by a "killer"
I would also get wrecked lol. Puppetmon would get bored and let me out after I haven't done challenge one after a few hours. That's real cool. They have these for a bunch of series. I think they even had one where I live but I didn't get hired. I bet this could be fun. Ooohhh man, please give us a report if you do! The Escape Rooms I've played (in tue US) don't let you take pictures inside the game area, but the waiting area/entrance is usually fine. Hope it will still be there when you visit!